Cloud storage. You have no idea what it is or how it works, but somehow it’s become one of the most important services there is. Through effective cloud storage, you can easily sync your files across a range of devices, backup your most important documents electronically, and ensure that your business—or your personal life—keeps on running as smoothly as ever. So it only makes sense that you’ll want to know which cloud storage service is the best—and which ones are simply decent alternatives. The first service many people turn to is Dropbox. 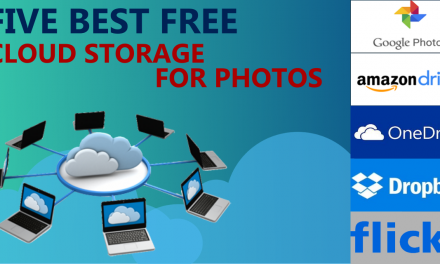 This is a popular cloud storage service because of its free offerings and convenient services. In fact, one of the primary debates in the world of cloud storage is Dropbox vs. Google Drive—and many people turn to Google Drive because it’s so easy to sync with other Google accounts, such as Gmail. But which service really lives up to the hype? To learn that, we’re going to compare Dropbox to the other top services and find out exactly which one is best for you after all. But before we do that, let’s take a step back and address the concept as a whole. It starts with a precise definition of cloud storage. Cloud storage is better understood as “remote storage.” When people hear the word “cloud,” they tend to think that your storage is somehow wireless. And that’s true, to an extent—but really, it’s only the saving that’s wireless. Your information still has to be sent to remote data centers where it can then be stored. Though it’s called the “cloud,” it’s more likely that your data is simply reserved in a large storage center owned by one of the top companies. It’s that simple. 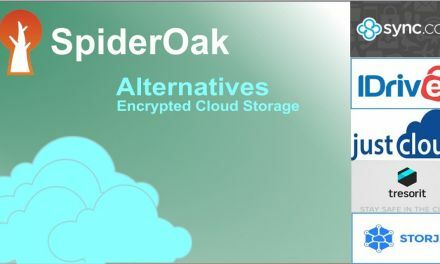 What about free cloud storage? It’s prevalent if you don’t have too much information to save. Dropbox, for example, offers a free cloud storage service up to a certain amount. After that, you’ll be expected to pay for the file syncing and storage services offered by the service. And this can be tremendously beneficial for companies—for example, imagine putting together a PowerPoint presentation of the utmost importance, only to miraculously lose it. Using Dropbox’s services you can look at previously saved drafts and recover a recent version with ease. While Dropbox is one of the top names in cloud storage, there’s plenty of demand for a Dropbox alternative, especially if you already use other services that can be more easily linked together with your existing infrastructure. We’re going to compare Dropbox here to some of the top names in the world of cloud storage, all from companies you’ll recognize—heck, you may even own stock in them. By exploring Dropbox’s services and comparing them directly, we’ll get an idea of which service is the best alternative—and which is the best for your individual needs. We’ll start by looking at the services generally offered by cloud storage. The most obvious is remote storage of files. But there’s also the quality and quantity of this storage, the ease with which these services sync files to cloud storage, and other options for backup and data recovery. Let’s look through each of them here. Dropbox is one of the top names here, and for good reason. File and version recovery, remote storage, password resetting, easy changing of user permissions—Dropbox essentially has it all. It’s a quality service that can integrate with third-party extensions for increased customization as well. If you read our Google Drive alternative reviews, you know plenty about this service. It’s not only easy to incorporate into your daily routine but easy to incorporate into your online accounts and emailing. It has many of the services described above, so it really doesn’t lag behind any of the others, especially when it comes to the free hosting of remote data. OneDrive can confuse people because it often comes attached with the rest of Microsoft’s services, yet some people never fully explore it. We’ve looked at OneDrive alternatives in the past, so you’ll likely remember many of the services offered here. It easily incorporates into your Windows operating system, if that’s a priority for you. iCloud is the offering from Apple, and Mac-friendly users will want to give it strong consideration as a Dropbox alternative—even though Dropbox works just fine on Mac. Consider it something of a direct competitor to OneDrive, though the two don’t have a lot of meeting ground in the middle. It seems as though Amazon is competing with everyone these days, and with its entry into cloud storage and remote data hosting, it’s competing here as well. Amazon Drive is loved by those with plenty of Amazon accounts already, but we’ll have to take a closer look at pricing before we can weigh its validity as an alternative to Dropbox. 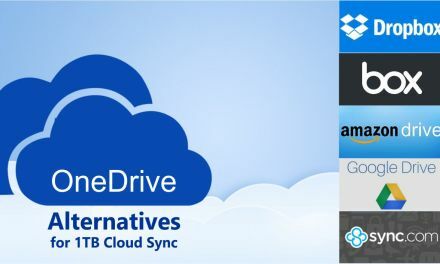 You may also consider reading more about Amazon Drive alternatives. How are we going to execute the comparisons? Simple: we’ll look at visual data here, putting different aspects of the Dropbox alternatives into different charts so you can easily see how they compare. And by comparing directly competing service tiers as closely as possible, we’ll have a much better idea of which services are really offering the best cloud storage value for the dollar. Looking at price, it’s hard not to come to the conclusion that Amazon Drive wins the day. It has very low offerings all around, but especially shines when you need a lot of remote storage at 1 TB of data, where it’s noticeably a few bucks shorter of the other options on this list. Dropbox came in with great prices in the free offerings, but then sharply increased when it came to the more expensive storage, though not completely out of range. Google Drive’s results echoed Dropbox’s, putting them both as good entry level cloud storage services but not necessarily for the next tier. OneDrive was firmly in the middle of the pack, coming in at $6.99 per terabyte in the more expensive option. iCloud sharply increased but did not follow through with a high-quality 1TB tier. Amazon Drive performed the best with price, keeping it minimal even for 1TB of storage. On this chart, we saw Amazon Drive curve steeply upward for more storage space, which is important for businesses to recognize—but perhaps more relevant is how little there was on offer for higher storage plans. Google Drive stopped at 1 TB, in the higher price range there, without offering a bargain over higher-storage solutions. OneDrive performed the best with the high-storage options, increasing only a little in price per month with 5 times the storage. iCloud moved about in line with Amazon Drive, stopping short of the more advanced tiers. Amazon Drive offers plenty of options, but unfortunately, it did offer the most expensive option at 5TB. Comparing only Google Drive and Amazon Drive here, we see that the advanced storage tiers have a generally lower price for the latter. Google Drive did offer advanced TB tiers, but at $299 per 30 TB, it was the more expensive option of the two. Amazon continued its excellent offerings for higher storage capacities, cutting Google Drive’s 30TB storage in half, price-wise. The above data gives us a way of standardizing both price and features, which in turn makes it easier to make direct comparisons of all the cloud storage offerings we have listed here. This makes it a great way to visualize how well each service performs for your individual storage needs. As you can see below, it’s easy to identify which tiers offer the best value for your ideal storage capacity. Here we’re comparing averages against competition, which means we can see the deviations of each individual cloud storage service. This is a way of relatively measuring these against each other to get an idea of which stacks up to the best. Vertically, we have value for money. Horizontally, we have cloud storage features. 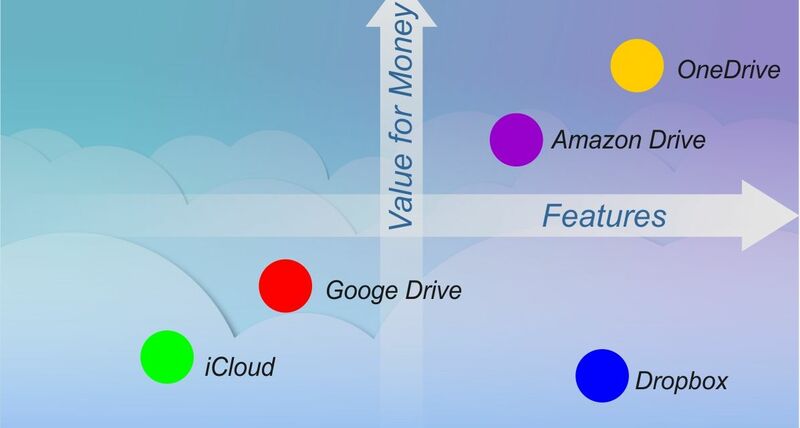 You want to be in the upper right quadrant, which is where Google Drive and Amazon Drive land. Dropbox performed well for features, but not necessarily value for money. That means it makes sense to buy Dropbox if you need it, but there are other bargains out there. Google Drive was a little on the negative side, though it still outperformed iCloud. OneDrive did outstanding, performing the very best of any services on the charter. With these measurements, iCloud performed worst both with value for the money and a number of features on offer. Amazon Drive was one of two services in the upper right quadrant, performing admirably. There a few reasons you might need cloud storage services: you might need to sync across devices. You might need simple data backup for important files like long presentations or books. You might simply need a way to clear out some clutter on your desk. But whatever it is, you can likely find those services provided here. As with our MediaFire alternatives, we were able to identify a range of services that offer plenty of features for reasonable prices—and, as one might expect, some companies outperform the rest. Which is best for you? The information above should serve as a great guide for getting started. And, if you are concerned about free cloud storage as the first step on the way to move to the cloud, we do recommend reading about five best cloud storages of 2017. Thank you for this great article! It has been very helpful to me. I do have one question though…what about photo storage? Does this analysis hold true for best cloud photo storage as well? Thank you for your suggestion. We are going to review and compare five best cloud photo storages soon. Hello! 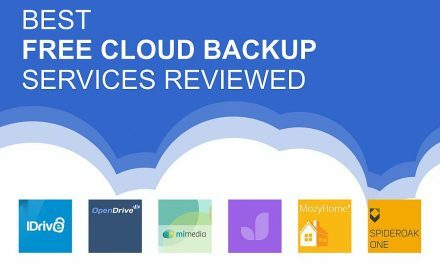 Have you guys reviewed the best choices yet for cloud photo storage? Thank you! Yes, please check on photo storage with the ability to BATCH rename. Google Drive does NOT allow this whichis unfortunate.